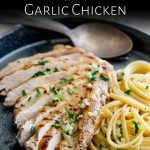 This Garlic Butter Pasta with Garlic Chicken is easy to make and is packed with plenty of buttery garlicky flavors. The simple Italian pasta is cooked with a delicious garlic butter sauce and has no cream in it. 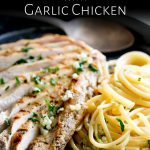 Served with juicy grilled chicken breasts, topped with more garlic butter, this is a family friendly dinner. 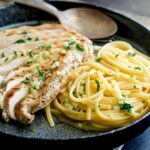 This Garlic Butter Pasta with Garlic Chicken is a deceptively simple pasta dish. The chicken is flattened and then grilled over a high heat to keep it succulent and juicy. And the garlic butter cooks slowly whilst the pasta cooks. To ensure the chicken cooks quickly and evenly you want to flatten the chicken out to one uniform thickness. Lay the chicken breast on a sheet of plastic wrap or baking paper. Cover with a second sheet of plastic wrap/baking paper. Take a meat mallet/rolling pin/heavy based fry pan and gently bash the chicken. Start at the thicker round end and move around the chicken breast until the whole thing is about 1/2 inch thick. Repeat with the second chicken breast. Alternatively you can fillet the chicken to create to thinner slices. As with so many pasta recipe on Sprinkles and Sprouts, make sure you reserve a cup of the pasta cooking water. This is how we create a smooth rich sauce without needed to add any cream or loads and loads of butter. Now I am not going to pretend there isn’t butter in this dish! I mean it is Garlic Butter Pasta. But for 4 people there is only 1 stick of butter (115g) which isn’t too bad for a butter sauce!!!!! Using the pasta water enhances the sauce and makes sure it coats every strand of pasta. It’s the starch you see! As you cook pasta some of the starch leaches out into the cooking water. This is what helps the water to thicken up your butter sauce whilst still keeping it light and buttery. IT IS MAGICAL!!!! It’s like a free ingredient! Plus it adds extra seasoning, assuming you have salted your pasta water well. Please please please salt you pasta water generously! And don’t add any oil to the water. Lets talk about why? When you add your pasta to boiling water, that is the only chance you have to season the inside of the pasta. Sure you can add extra seasoning at the end or to the sauce, but that will stay on the outside. Adding salt to the pasta water, means it move inside the pasta as the pasta absorbs the cooking water. Extra flavor guys!!! How much salt to add to pasta cooking water? I recommend adding 1 tablespoon of sea salt for 1 pound of pasta cooked in a 4 quart pot. This will flavour the pasta inside and out, making your end dish so much more delicious!!! If you are cooking significantly less pasta then you can reduce the salt, amount of water and size of the pan. But if it is just a small amount less (like this recipe) then I would use the same amount of water and the same amount of salt. Why you shouldn’t add oil to the pasta water. Many people suggest adding oil to your pasta water to stop the pasta sticking together. It doesn’t work. If you have ever added oil to water you know they don’t mix, the oil just sits on top of the water. Your pasta may get a little oil on it as you stir, but not enough to stop it sticking together. The key to stop pasta sticking together is to cook pasta in a very large pot of water that is at a rolling boil. To recap, generously salt your pasta water (1 tablespoon) and don’t oil the water. 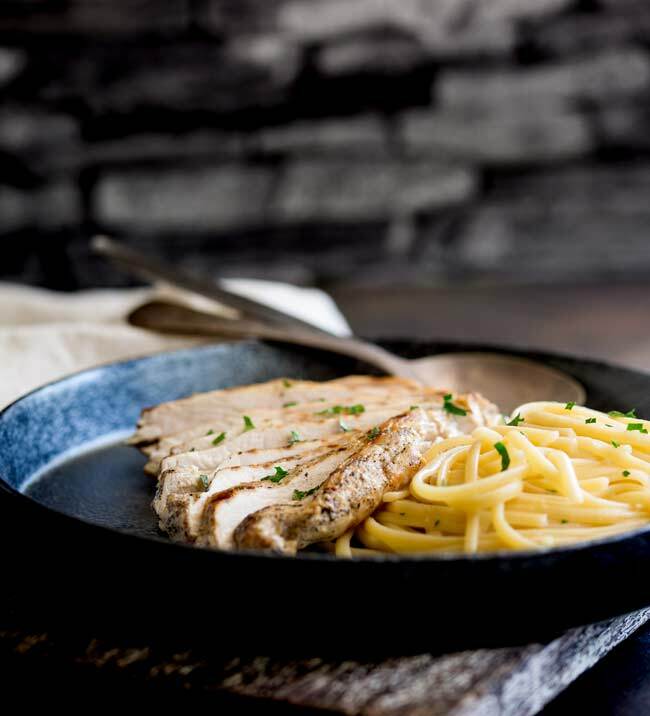 Wine: This garlic chicken and pasta is perfect for pairing with a sparkling wine. A Prosecco would be perfect here. Alternatively a dry whites like Vermentino would be delicious. If you don’t fancy a white then pick a dry rose like a Tavel rose. I am yet to find a red that works really well with this dish, most are overpowered by the garlic, but if you are dead set on a red wine then a full-bodied Shiraz can hold it’s own. Or for something totally different, take a note from the Spanish and serve a Manzanilla or fino sherry with the pasta. it’s unusual but it works. 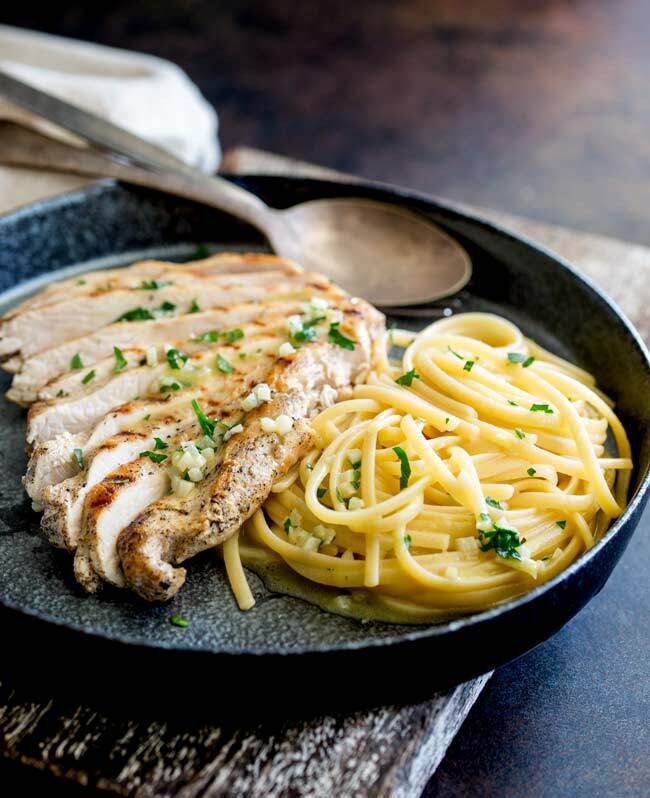 Why not pin this recipe for Garlic Butter Pasta with Garlic Chicken. Pin it here. Melt the stick of butter over a low heat in a small pan. Add the garlic to the butter and cook it over a very low heat. Don’t let the garlic color. Place the chicken on a chopping board and cover with a piece of baking paper or clingfilm. Use the flat side of a meat mallet (or a heavy rolling pin) to flatten the chicken until it is 1/2″ thick. Season the chicken with salt and pepper and the garlic powder. Heat the olive oil in a heavy based skillet. Once it is hot, sear the chicken over a high heat. Cook for 2 minutes on one side and then flip and cook for a further 2 minutes or until it is just cooked through. Remove from the heat and tent with foil to keep warm. Once the water is boiling, add 1 tbsp of salt and add the pasta. Cook the pasta until al-dente. Reserve a cup of the pasta cooking water and then drain the pasta. Then return it to the pan. Pour half of the garlic butter into the pasta, add 1/4 cup of the pasta cooking water and then stir in the pasta. Cook over a medium heat until everything is well coated. 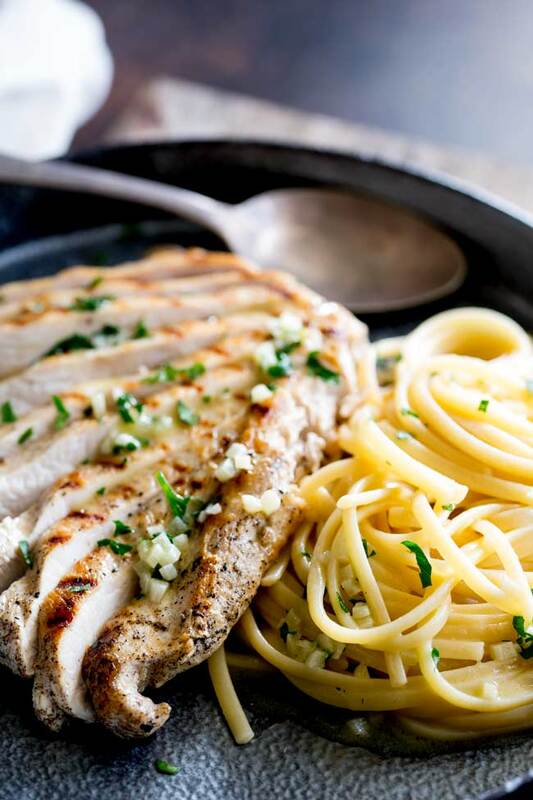 Slice the chicken and serve along side the pasta. Drizzle the dish with the remaining butter and garnish with chopped parsley. 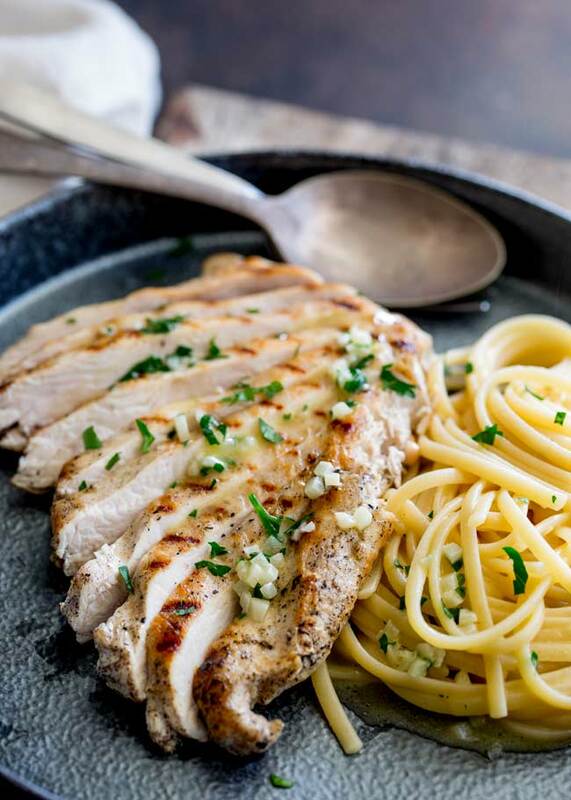 If you love food why not subscribe to my newsletter, I will drop you an email every now and then, just to say hi and send you a couple of recipes I think you might love, like this Garlic Butter Pasta with Garlic Chicken. I was taught that adding oil to your pasta isn’t used to stop the pasta from sticking together, but rather to stop the water in the pot from foaming and boiling over. It works! Interesting, and great that it works. I go for using a very large pan for my pasta as cleaning the hob is not one of my favorite jobs. Garlic and butter – a match made in heaven! Add pasta and chicken? Well, it doesn’t sound like it could get much better than this recipe. Beautiful! I cannot wait to try.